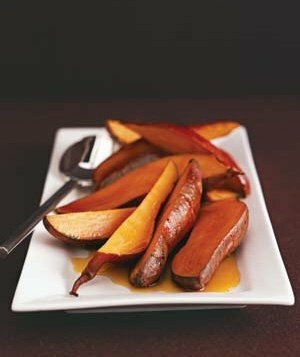 Maple syrup and vanilla are wonderful together on these delicious sweet potatoes. Scrub the sweet potatoes, pierce each with a fork, and place in oven directly on the rack with the turkey (or in a preheated 350º F oven). Bake 45 minutes to 1 hour or until fork-tender. Remove the potatoes from the oven and cut each lengthwise into 4 wedges. Arrange on a serving dish, sprinkle with the salt, and pour the scented syrup (without the cloves and vanilla bean) over them.